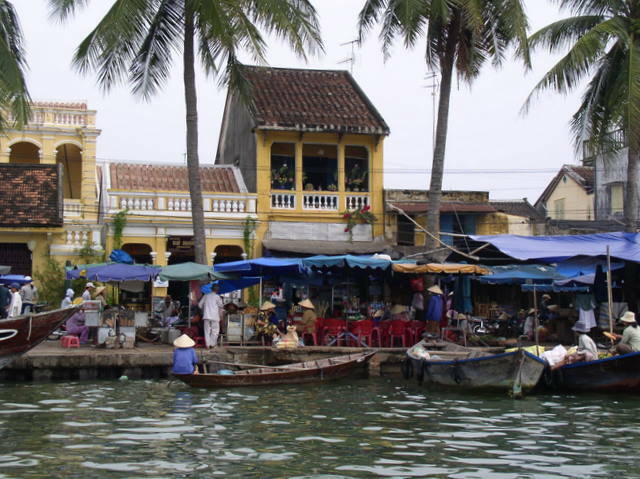 Vietnam is one of the most popular holiday haunts in South East Asia. Visitor numbers are skyrocketing yet it’s possible to enjoy moments of serendipity by simply avoiding the norm and taking it slow. One balmy night in Hoi An, a quaint World Heritage-listed town on the Vietnam coast, we ignored all the restaurants listed in the guide books, all of which were packed with travellers eating cheek by jowl. By taking a simple stroll in the opposite direction, walking beside the Thu Bon River, we eventually arrived at the Cargo Club (107-109 Nguyen Thai Hoc) where on an upstairs balcony we had all the elbow room imaginable, along with enviable tranquillity, marvellous river views and a meal to remember. Sampans were moored along the banks below. The shouts of children at play echoed across the water. It’s possible to see a lot of Vietnam in just one trip but, like the local cuisine, it’s a country best sampled in tasty portions, and preferably at a relaxed pace. 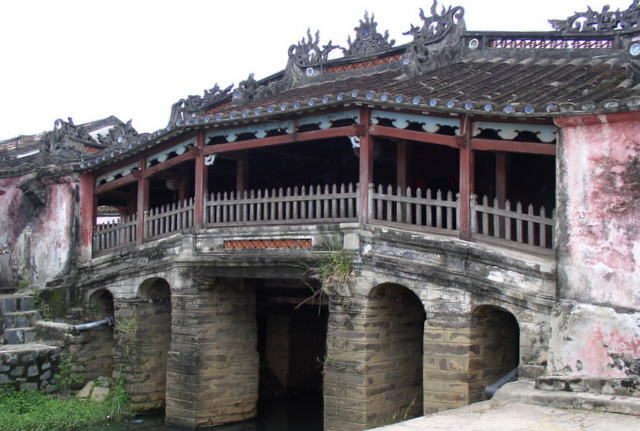 Between the 15th Century and late 19th Century, when the river silted up and closed the port, Hoi An hosted traders from China and Japan, England, Europe and America. A focal point is the red wooden Japanese covered bridge, housing a small temple for sailors, which spans the river to the old Chinese quarter where narrow lanes are lined with tiny houses. A ceramics museum (80 Tran Phu St) has information in English about Hoi An’s history. There’s a score of assembly halls, temples and traditional craft shops to see. Some ancient houses are open to visitors, including the 200-year-old Than Ky House, a private home that’s been painstakingly preserved. It’s right on the riverfront, close to the the Cargo Club. You’ll need to linger three or more days if you wish to take advantage of the renowned tailors of Vietnam’s made-to-measure capital. The is the main reason many tourists visit Hoi An. And while many mouth doubts over the quality of materials this doesn’t stop them spending! We particularly admired one woman’s bespoke jacket, made of a unique combination of mohair with Terylene. After my last post about wanting fresh air in hotels, I thought it apt to write about the ‘freshest’ hotel I’ve ever slept in – a hotel made totally of ice! It’s also ranks as the ‘coolest’ hotel I’ve experienced. 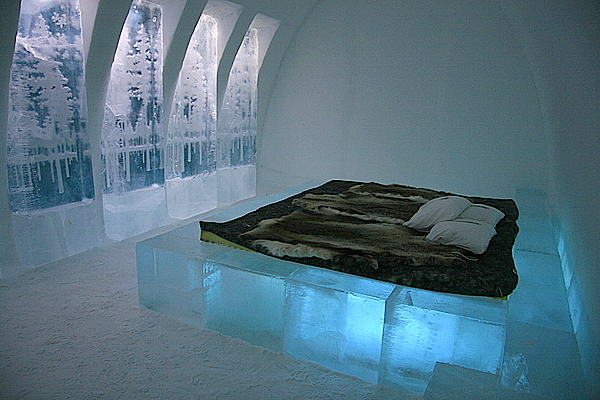 First built in 1990 some 200 kilometres inside the Arctic Circle, the IceHotel in Sweden’s Lapland is the real deal. It’s the original, the one that’s since been copied in various other chilly countries in a variety of imitations. Making the Swedish hotel even more remarkable is the fact that it is completely rebuilt every year. The IceHotel materializes in late October-early November in the Swedish village of Jukkasjarvi near the Arctic mining town of Kiruna. The entire building is made of massive ice blocks carved from the nearby frozen River Torne. These hewn blocks are augmented with snice – snow produced by a snow-making machine. The hotel owner says the unrivalled purity of the Torne’s waters render the Jukkasjarvi hotel the finest, purest, IceHotel of them all. Each season the Icehotel gets bigger, opening in sections, each filled with guests while the rest of the hotel is still being built. At the end of the season the entire structure simply melts away, flowing back into the Torne. Within the hotel’s frozen walls one’s sense of reality is challenged by a eerie, silent, yet fascinating world of white, blue and green – rather similar to being underwater. Hotel rooms are set off low corridors of packed white snow. 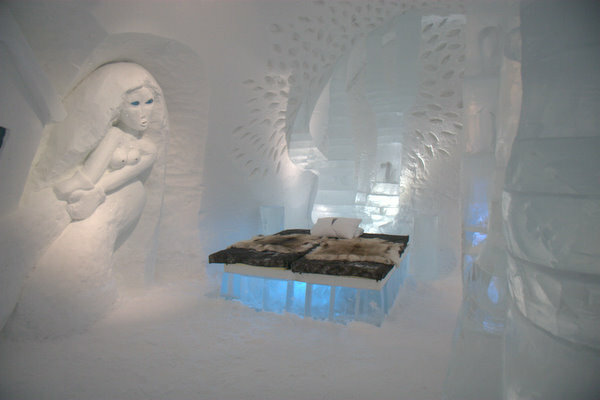 The Jukkasjarvi IceHotel is famous for its unique Art Suites, each one designed by a different international artist chosen annually from a list of more than 200 applications. The end results are so extraordinary they attract day tourists to Jukkasjarvi as well as creating an international buzz. These wondrously carved suites complement the hotel’s standard rooms. 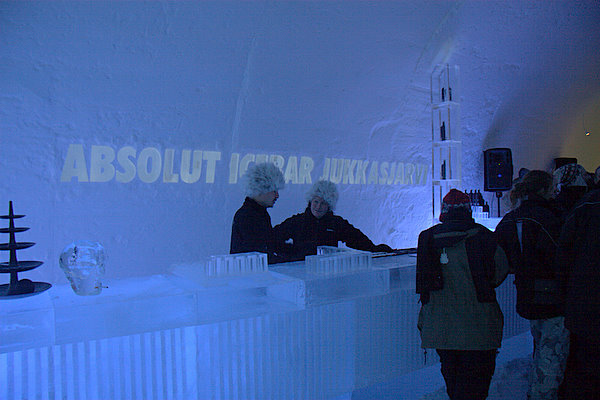 Guests socialize at the Absolut Ice Bar, where lurid vodka-based cocktails are served in chunky ice glasses. Each glass lasts long enough for two or three drinks before starting to melt in the heat of your gloved hand. The temperature inside the hotel is kept between -5ºC and -8ºC. Guests are given Arctic sleeping bags and prepare for bed in an adjacent, warm, changing room where they leave bags and clothing in a locker before retiring to bed in thermal underwear. You keep your shoes, nip smartly across an open courtyard and into the hotel, then speed down one of its lengthy, domed white corridors to your room built entirely of packed snow with a dome roof. Beds are wooden pallets supporting a foam mattress covered in reindeer skins. Tucked up in my sleeping bag I was as warm as toast. Note that there no ensuite rooms in the Icehotel so any pressing urgency during the night means another speedy excursion to the change rooms. 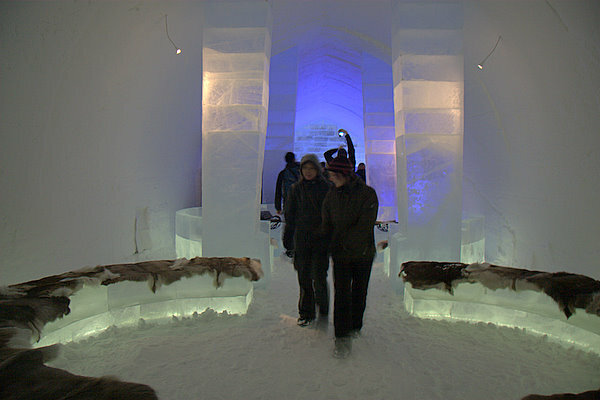 Most guests combine a night in the IceHotel with one or more in one of the hotel’s heated wooden chalets. Whatever your choice make sure you add this remarkable chunk of Jukkasjarvi ice onto your bucket list. There’s a simple question I ask when booking a hotel room. Can I open the windows? I’ve lost count of the sleepless nights spent incarcerated in a room with views through thick panes of glass set rigidly into the wall. Being captive in such a state renders me a caged animal. Why would anyone even consider building a room with windows that don’t open? I simply don’t understand such warped logic. You can quote safety regulations all you want but what I want as a traveller is the ability to breathe in and to hear wherever it is I am. That’s intrinsic to my being there. Should things outside my hotel room become adversely noisy, smelly or whatever then I can always simply close the window. I should have that choice. Sadly, many hotels deny us the basic human right of breathing in fresh air. Instead we are doomed to incarceration and forced to inhale recycled air billowing into the room from an air-conditioning system and invariably positioned most inappropriately, blowing directly onto the bed so guests are chilled to the bone when asleep. Even worse in my book are those hotels in which rooms have the double damnation of fixed windows and air-con you can’t adjust or switch off. And if granted in-room control of their air-con, then guests often face another vexing issue, that the air-con systems in “enclosed” hotels are nearly always so noisy. I’ve spent nights switching off the apparatus for some peace and quiet only to have to switch it back on within an hour because I’m gasping for oxygen or about to faint from stifling heat. The solution is easy? A simple breeze. It works wonders in combating both heat and fatigue and promoting relaxation. Open those windows, please! A few days at the wonderful E&O Hotel in Penang, Malaysia, was a reminder of the outstanding value Asia offers travellers. We’d left it rather late and booked only a few weeks in advance. Yet for the price of a nondescript room in a second-rate hotel in my home town of Sydney, instead at the E&O we were given a spacious deluxe suite with sea views – as well as free broadband. Other luxury hotels should take note! The specialty of the Eastern & Oriental is gracious “old-school” hospitality. And our bargain room rate included superb breakfast spreads to entice lengthy lingering: fresh fruit, cereals, eggs cooked to order every which way, hot dishes ranging from congee to hash browns, waffles with a bewildering variety of toppings, fresh espresso and tea. All this bounty – and service with a smile. It was difficult not to spend the entire morning over such a meal enjoyed on the verandah overlooking the sea. The E&O was created by Armenian brothers the Sarkies in the late 1800s, the same lads who were originally responsible for creating Raffles in Singapore and the Strand Hotel in Rangoon, Burma. The Penang hotel has had its ups and down over the years and was recently restored. Thankfully it retains a pervading sense of the colonial grandeur and refined sense of service that in past years has pleased a honour-roll of guests such as Rudyard Kipling and Herman Hesse, Charlie Chaplin and Noel Coward. 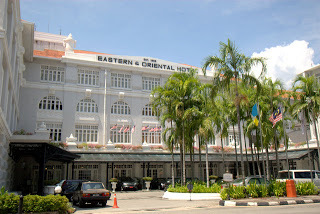 Although it’s Penang’s grande dame of hotels, the E&O is devoid of snootiness and exclusivity. Everyone may pass through its doors and are made welcome by a courteous and friendly staff. More tellingly, half of Penang seems to eat there on the hotel’s regular buffet nights, which is all the more remarkable considering Penang’s reputation as a city brimming with culinary competition and renowned globally as a foodie hot spot.